Mortgage brokers vs banks: which is the right choice? Shopping for a home loan is an exciting time - after all, you’re on your way to owning your dream home! But it can also be a little overwhelming. Between interest rates, property jargon and lenders giving you the run around, it can start to get pretty stressful. So sometimes it’s worth looking for some help when you’re trying to find the right home loan fit. That’s where mortgage brokers come into the picture. But is that the right option for you? Or are you better off heading down to your local bank branch? 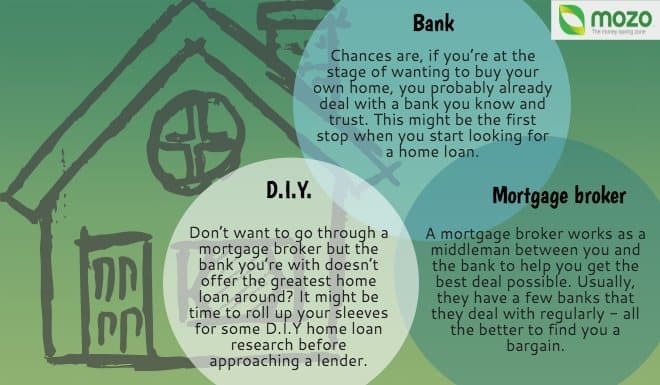 We’ve broken down the differences between mortgage brokers and banks to help you work it out. If you’re already a customer of the bank, you probably know and trust their service. To check out what other customers think of your bank, find them in our customer reviews. If you’re heading out to your nearest bank branch or jumping online to find a home loan, there are a few things you can do to make sure you’re getting the best bang for your buck. Here are our top tips for approaching a bank directly to find a home loan. Haggle. The interest rate on your home loan can make a big difference. For example, our rate change calculator shows that on a $500,000 home loan, the difference between a 3.94% interest rate and a 4.69% interest rate would be $210 each month on a 25 year loan. So don’t be scared to ask for a better deal. Bundle. One of the perks of sticking with your current bank is that if you bundle your existing banking products with your home loan, you could snag a better interest rate, or even cash in on special bonus offers. Although many brokers don’t charge you a fee, some do, so you have to be careful that you’re not being overcharged. The good news is, there are a few ways you can get around the pitfalls of using a mortgage broker. If that’s the path you want to take, we have a few tips for how to make it work for you. Choose your broker carefully. Not only do you want to work with someone you trust and like, but look for a broker who has the right skills and attitude to get you a better deal. Also, find out what providers they deal with, and make sure those options will be a good fit for you. Break it down. Ask your mortgage broker to break down each of their recommendations and justify why it’s a good deal - make sure they’re taking into account your individual loan situation and not just fishing for the highest commission. One of the useful things about working with a mortgage broker is that they can calculate loan costs based on your specific circumstances and compare deals accordingly, which is something you may find a little harder to do yourself. For example, the comparison rate is a handy tool for seeing the true cost of home loans you’re comparing, but it’s based on a set scenario. A mortgage broker can base comparisons on your circumstances. But the good news is there are a few tools you can use to do this yourself. Our home loan calculators will let you plug in your loan details - like how much you want to borrow, your loan term and the interest rate you’re considering - and will give you the details of what that loan might cost you, both all up and in monthly repayments. So if you do decide to go D.I.Y with your home loan comparisons, be sure to check out all the resources we’ve compiled on our home loans page. Where else can I find help with my home loan? There are a few stops you could make on the road to finding a great home loan deal. No matter what, the first place you visit should be a home loan comparison, so you can get a feel for the market and what’s out there. If you don’t want to click through and sort yourself out from there, you could head over and check out Mozo’s mystery bank deal and check out exclusive low rate offers from the big four banks and smaller lenders too. Or, if you’d rather talk to a person about your home loan search, get in touch with our resident home loan negotiator, Steve, and he’ll help you snag a great deal on your home loan.